Window film is something many homeowners consider because of its numerous benefits including energy savings and glare reduction. But, it is also a well-known and very effective way to keep homes safe from a variety of dangers. In fact, the ways in which window film will work to keep your Fort Collins home safer are plentiful with varying mechanisms of protection. One common denominator of protection: window film provides a more secure place for your family to thrive in. It is these varying levels and methods of protection though, that make window film worth the relatively low cost of having it installed and make it among one of the most beneficial home improvements money can buy. Find out more below on window film and the incredible ways it keeps you safe in your Fort Collins home. 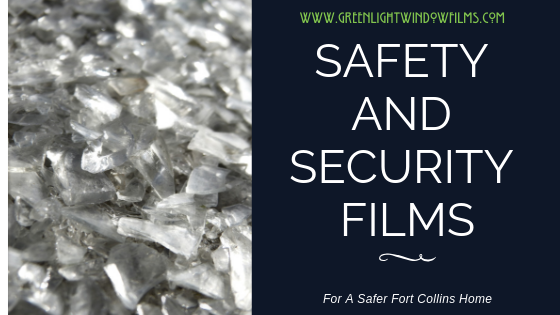 Safety & Security Films are the perfect barrier against home invasion. They are designed to make the window glass shatter-resistant like laminated glass. The reason they are so effective is– should an intruder try to break a window in your home, the broken glass remains attached to the film so the window cannot be easily penetrated, meaning the would-be thief cannot enter your home without substantial efforts and time. Building codes in Fort Collins often require tempered or laminated glass for the glass parts of your home considered “dangerous” areas”. This means they are places where a slip and fall could result in glass breaking and hurting or killing someone: glass doors, bathroom glass, windows, balconies or at the bottom of staircases. When remodeling your home bringing these areas up to code is often something that is required and means installing expensive tempered glass. However, Window film, satisfies this requirement and is much more affordable too. Therefore it is a cost-effective and suitable workaround for installing tempered or laminated glass. These caustic rays from the sun through your Fort Collins’ homes windows could, in fact, be adding increased and needless risks to your family’s health –because glass alone will not stop UV rays. Having window film installed, which blocks 99.9% of harmful rays (including UVA and UVB) and offers the same protection as an SPF 2000 sunscreen is a sound way to protect you and your family from deadly diseases stemming from the sun. Here in Fort Collins, we get powerful storms all the time. We get brutal hail storms, the occasional tornado and even, hurricane force winds. Window film is a way to greatly reduce the risk of injury from natural disasters and storms; preventing flying shards of broken glass, and inhibiting debris and water penetration through broken windows. For more information on window film to make your Fort Collins home safer in any number of ways, contact us at Green Light Window Films today!